Hungry for creativity? Build your own Bento Box filled with art in this jam-packed workshop. We will be making a series of projects, small in size but big in impact, that will each nest inside its own container – think tins, boxes, bags, etc. Each of these will in turn be placed and housed inside one larger box, creating a very special treasure chest. 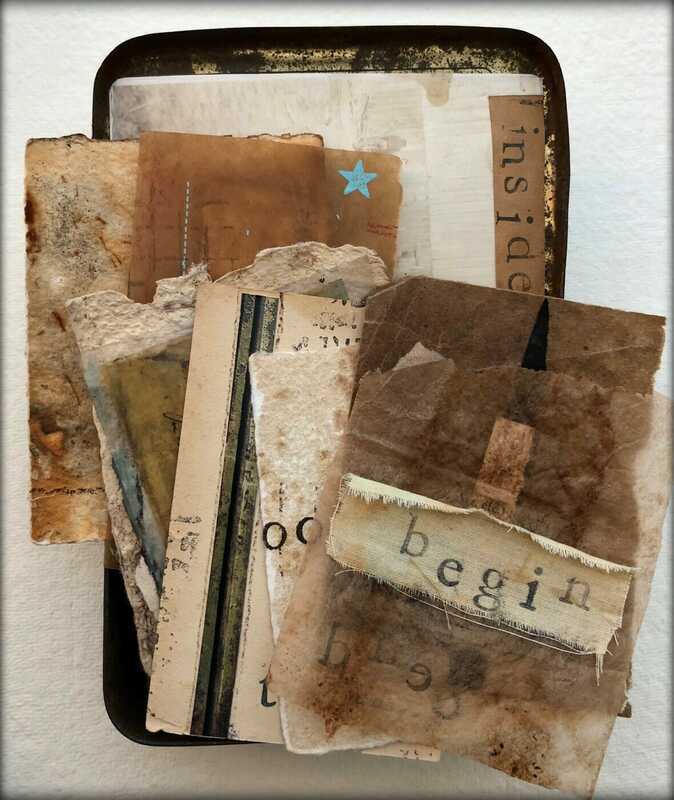 Your unique art pieces will include some combination of handmade books, paintings, collages, assemblages, scrolls, wraps, shrines, and more. 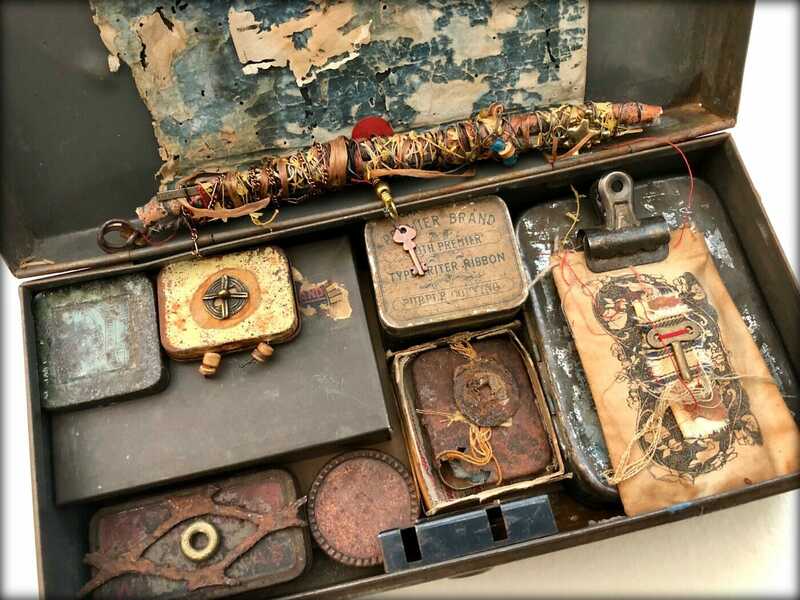 In the end, the process of opening and exploring the contents of the box becomes a magical part of the art. Box. Bring your own box of any material (metal or wood is preferred) to house your projects. Size can vary but close to 6x10x4 inches would work well. It can be open, with a hinged lid, or have a separate cover. It can have compartments or be one open space. Feel free to send me an image and measurement of your choice if you are unsure if it will work. Containers. 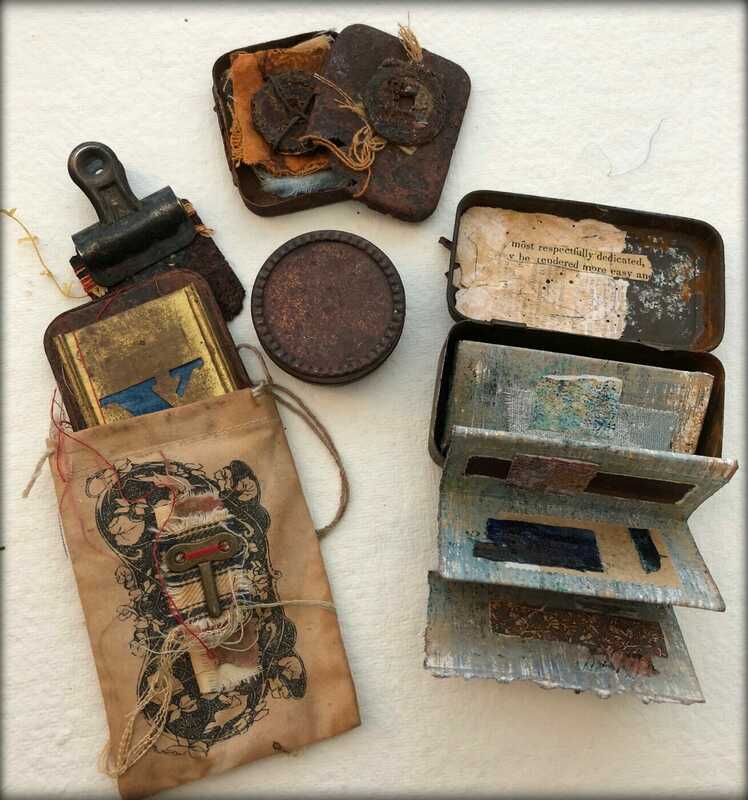 Bring a selection of small tins, boxes, bags, vessels (with and/or without covers) which will hold your creations and stack inside your larger box. Bring an assortment so you have a number of to choose from as you make your projects. Flotsam and Jetsam. Bring in assorted material to personalize your projects. Think small in size and include your choice of collage material (ephemera, papers, photographs, etc. ), fabric scraps and thread, small embellishments (found objects, rusty bits, charms, beads, bling, etc. ), natural objects (twigs, pods, leaves, etc.) and commercial products (embellishments, stamps, rub-ons, washi tape, etc.). Note this is a 2 day workshop.